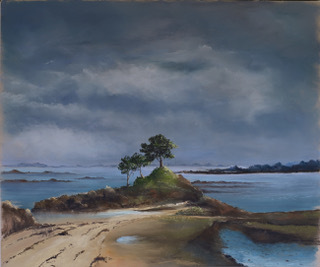 Agnès Pormenté lives and works in Paimpol, a village in Britany with seaside landscapes, abrupt cliffs, and green paths. A paradise for the artist, who likes to contemplate, observe and pay tribute to nature. And what a tribute! Each artwork is photographically but also sensitively true to these fascinating landscapes. Soft and luminous, Agnès Pormenté’s compositions immerges us into a world where nature is as stunning as it is immutable. We can rest there, leaving the tumult and the hassle behind us, replenishing our spirit, as we were actually facing the beauty of the landscape. Art is the story of Agnès Pormenté’s life. Her childhood has always been animated by music and paintings. From the Ecole Normale de Musique de Paris, she used to regularly visit sculptor Madeleine-Pierre Querolle’s studio. She will finally decide to pursue a high school teacher career but never far from the practice of painting. She uses pastel with her fingers as she would be playing the piano. Nature becomes a moving, harmonious and colorful sheet. The artist never put herself forward and she says: “She learnt from music how to serve a text, an author, or others’ inspiration by stepping aside”. Agnès Pormenté, Cascade (1), Majeur (2), Force, sollicitude et protection (3) – Pastel sur papier. But the eye and the hand remain autonomous interpreters and we recognize a work by Agnès Pormenté to its vaporous treatment of matter, its pigments filled with light, its subtle details. Agnès Pormenté will exhibit with Mecenavie on the art fairs ArtExpo New York (April 4th – 7th) and Art Shopping Deauville (April 20th – 22nd). Website of the artist : Agnès Pormenté.